Quote Reply Topic: third reef row??? Is there anyone out there, please, who had a third reef row put into the main sail ?? Is it a good idea ?? I sail a 312 which I have just bought. I have a third reef & felt it was necessary as I have been overpowered in high winds with the main only & only 2 reefs. 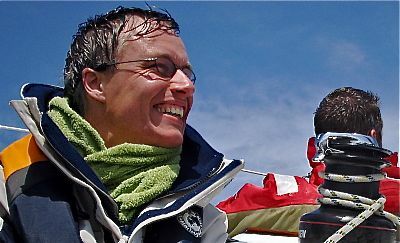 The system has to be set up differently to the existing single line reefing as one does not want the lines flapping on the sail all the way up to the third reef point. Have slots cut in the boom cover at the correct spot to line with the reef points as it does for first & second reef. Splice a short line with loops each end which goes around the boom & through the slots. Tie 2 knots in the line to prevent it falling back through the slots when not in use. The ends would normally just lay inside the cover. Fortunately Hanse do not skimp the control line lengths so you can use the clew outhaul to pull the clew on the third reef if it is long enough. To do this you need a good quality snap shackle fitted to the clew outhaul. Transfer the clew outhaul ( which will be redundant as you will already have the other 2 reefs in) to the strop. this means when you tighten the clew outhaul which is now the third reef outhaul it pulls the sail down & outwards as the strop tightens itsel as it is pulled. The pull is a bit better than the pull you get from first & second reefs & as it is a single line you can get a better set. You should look at the mast end before doing this & what I use is a short strop 21 inches long. I half this & pass the bight through the spinnaker ring on the front of the mast. The 2 end pass through this & this stops you dropping it over the side. You can set this prior to sailing if you are expecting heavy weather. It will just hang off the ring. You take the 2 ends ( With snap shackles attached ) either side of the mast & fasten to the 2 metal rings on the luff of the sail. The idea is to give a FIXED point of pull. 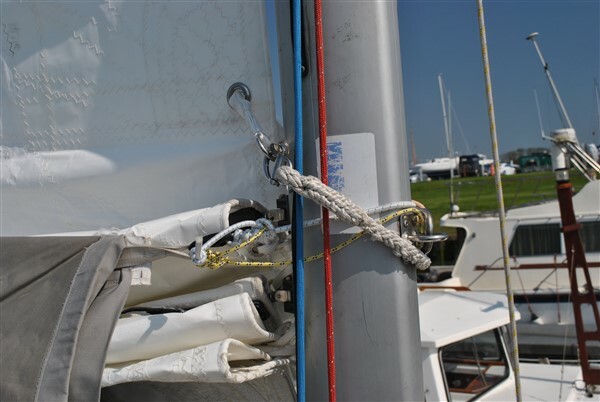 If you did what I did first time round & use a line to the mast foot you can easily tighten too hard & pull the redundant sail slides down the mast & the stopper pops out and the sail unravels. 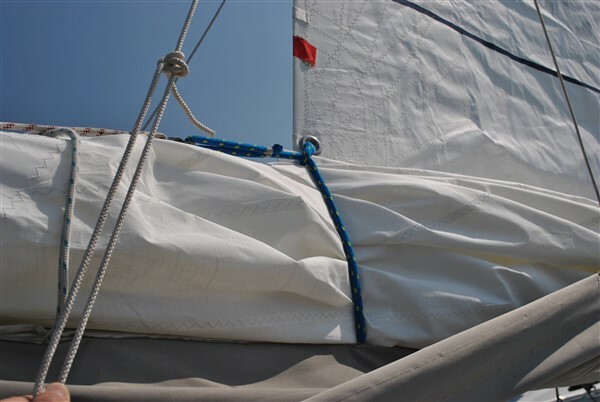 The forward strop has to fix to the spinnaker ring as if it came straight to the deck it would not give any forward pull & as you tension the outhaul you would pull the luff aft. having 2 ends to this strop also keeps the sail luff sitting centrally. Finally you need to mark on the sail where you want the sliders at the 3rd reef position. You cannot have any right near this point as you would not be able to pull the sail down low as the slider on the sail immediately above or below the 3rd reef would hit on the other sliders & prevent it coming down ,or you may pull them out of the track. You have to go forward in a blow to set the front strop & you have to drop the boom into the cockpit to transfer the clew outhaul but if you leave port with a reef on to start with you can have the clew outhaul unhooked & laying in the cover ready to use. To drop the boom into the cockpit you need to slacken the lazyjacks. however, you do not want to fiddle with this in a blow so what I have done is fit a really strong bungee to the end of the lazyjacks at the mast foot. This allows me to get a bit more pull when I need it & it takes the slack out when i don't. All works OK & the awkward bit is going on deck when it is rough to fix the mast strop. Perhaps it is the system of 1st & second reef & furling jib that makes me lazy. Still it beats the old days when i had to go forward to unhank & change foresails as well. Now there's a story !!! Do you have some pictures to make it even more clear?? Please, put some pictures (expecially of the forward strop system). With sailing a slightly bigger yacht and having a fixed rod kicker, I use a slightly different set-up for the third reef. I have previously described it here. The general concensus is that with the wind forward of the beam, the Hanses sail very well, reefing the main until it is down to a third reef, and only then do you start to think about doing anything with the jib, but by then it is probably blowing a F6. Though you may only use it a couple of times a year, knowing how to set up a third reef gives you so much more confidence. Thanks Samuel for the pictures. I wonder how difficult it is to pass the strop through the aft eyelet during the maneuver in high sea/wind, while the sail is beating madly and the boom is place outward. Apart from going forward, which I always hate in any conditions, the whole operation is quite quick. Since I have had it I have not done it above f8 but it works in quite windy weather OK so I am confident. A thinner dynema strop would be easier to threadle through the sail but I do not find it necessary.